Assemble the "Six Essentials for Going Outdoors" (Wolf Handbook, Elective 23b) and discuss their purpose, and complete four of the outdoor activities listed below. Earn the Cub Scout Leave No Trace Award (Bear Handbook, Elective 25h) and compete five of the outdoor activities listed below. 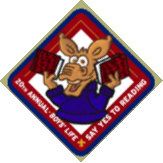 The 2008 Boys’ Life reading contest will be announced in the May 2008 issue of the magazine. Once again, there will be great prizes for the winners and free patches to all who enter. The 2007 winners will also be announced in May. Your Webelos I Den Leaders are completing a year of service. How about recognizing them and urging them on for next year by presenting them their Webelos Den Leader Training Award?? By the way - Webelos always ends with an S whether talking about one Webelos Scout or a den of Webelos. It is an acronym – WE’ll BE LOyal Scouts. As the CS RT Commissioner who trained me says – if you don’t have an S at the end – then there is nothing to which to be loyal. The Webelos Den Leader Training Award program is a lot like most of the training awards a leader is able to earn. Leaders that have completed the requirements and training have made the commitment to do the program right. They , have assistants in place, conduct well planned meetings and more. If you look at the requirements, you may not meet all 11 of the Performance requirements, but if you have a FUN and successful program, you probably have already completed seven of them and earned the award. This award recognizes people for putting the tools in place to succeed, and the rest is easy. Complete one year as a registered Webelos den leader. Complete Webelos Den Leader Fast Start training. Complete New Leader Essentials and Webelos Den Leader Specific Training. At least once, reregister a minimum of 75 percent of the eligible members of your den as part of a pack rechartering. Have an assistant den leader or second adult who regularly attends your den?s meetings and activities. Have a den chief who regularly meets with your den. Take leadership in planning and conducting two Webelos overnight campouts or other outdoor den activities each year.